River Rats a Brown water Navy story centered around 1970 during the Cambodian Invasion. It speaks of the sailors of YRBM 21 on the Mekong River at An Long Village supporting the Grand Canal, and the border and the different RIVDIVs and River Assault Squadrons 13 & 15 on border interdiction Operations. Mr. Fry, YRBM 21 OIC, and Dan Backus, ENG/REP Officer, were both advisors as well as Kirk Ferguson (CO of STABRON 20), Larry Bissonnette and Al DeRoco, both CO’s of RIVDIV 593, John Perry of HAL-3, Det-9, Chief “Patches” Watson (SEAL TEAM II) and many other commanders and shipmates. I also talk about ATSB Ben Keo on the Vam Co Dong and Operation Slingshot. River Rats tells the story of the big team and all the different units, as witnessed through the eyes of a 20 year old Naval Support Activity snipe from Virginia. 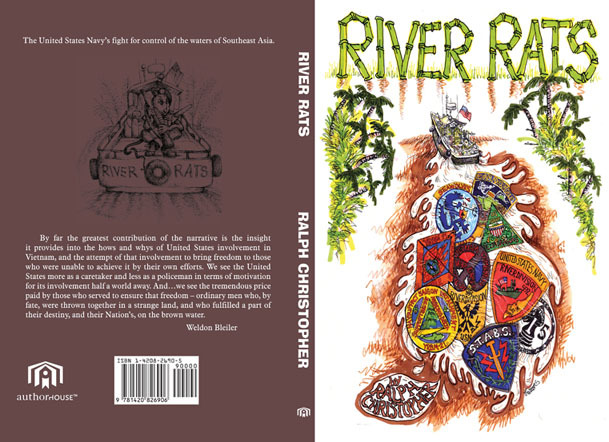 River Rats is 279 pages with original artwork on front, back and a great map created and drawn by Button Boggs, with 47 new pictures. The book can be purchased for $15.00 soft copy or $24.00 hard dustcover from Gamewardens of Vietnam at www.tf116.org Also, Amazon, Barnes and Noble, or other websites, by searching River Rats by Ralph Christopher. You can also order by calling Authorhouse Publishing toll free at 1-888-280-7715. It was my honor telling this story and I hope it shines well on the River Rats for they were the best. LAS VEGAS – From the foggy pages of history and the muddy waters of far-off lands comes Ralph Christopher’s new book, River Rats (now available through AuthorHouse), the true story of an elite group of men who wrote a page in United States naval history. Christopher invites readers to step back in time to a land most young men knew little about when they found themselves defending freedom in South Vietnam. River Rats is an autobiographical account of his tour as a 20-year-old member of the “Brown Water Navy,” made up of small units that manned naval firebases and floating detachments and rode patrol boats alongside South Vietnamese troops, mercenaries and regional forces. These units were the first to intercept communist forces trying to transport weapons and supplies into the Republic of Vietnam via the Ho Chi Minh Trail. Christopher brings each page to life with vivid descriptions of government operations and day-to-day life that can only come from someone who was there to witness it firsthand. Readers see the overthrow of the Cambodian government and relive the grim realities of war as the bodies of Vietnamese refugees float past U.S. servicemen in the Mekong River. With no shortage of action and page-turning suspense, Christopher’s account puts readers squarely in the middle of the action. From pre-war training and charging headlong into enemy fire aboard a patrol boat to visiting President Nixon in Washington and hearing the American outcry against the conflict, River Rats leaves no corner of the war unexplored. After serving in Vietnam with the U.S. Navy, Christopher returned home to Virginia and attended classes at Virginia Commonwealth University. In 1982, he graduated from the Musicians Institute of Technology in Hollywood, Calif. He is now a veteran performer and recording artist. He lives with his family in Nevada and works with young adults, music and veterans affairs.